Plant tissues. Meristems. Shoot apical meristem. Atlas of plant and animal tissues. The image is from grapevine shoot. Put the cursor over the image to see where the image comes from. Organ: stem, primary apical meristem. 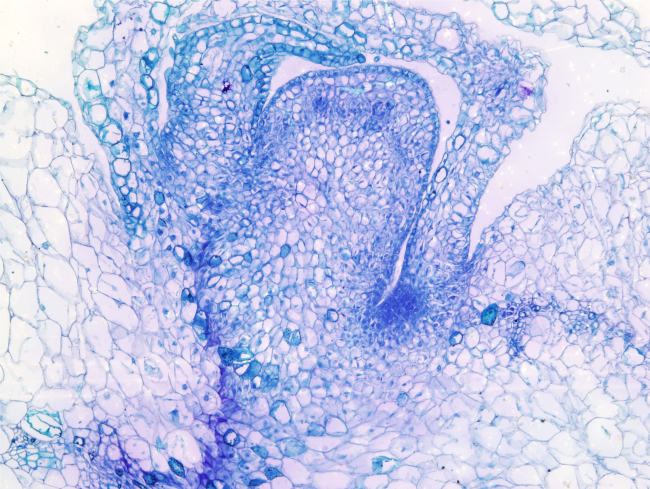 Technique: paraffin section stained with methylen blue (Image courtesy of Xurxo Gago). Shoot apical meristem consists of undefferentiated cells with a high mitotic activity, at a rate that depends on the environmental conditions. For example, it may follow circadian rhythms. As in the root meristem, during mitosis, the cell plate of new shoot meristematic cells is perpendicular to the longitudinal axis of the shoot, and this kind of division is referred as transverse anticlinal division (see figure). Primary stem tissues are originated from this meristem. However, shoot apical meristem is more complex than the root apical meristem because it gives rise to all shoot tissues, but also leaf primordiums and axillary buds, both located in shoot nodes. 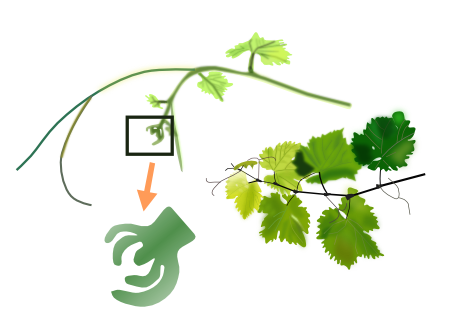 During the primary growth, axillary buds give rise to side branches (lateral shoots), leaves of the branches and reproductive organs. The axillary buds will become apical meristem in the branches and have similar organization to the main shoot apical meristem. 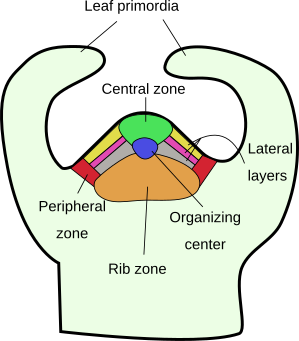 This means that cells from the shoot apical meristem differentiate into all the aerial organs. The shoot apical meristem is not covered by a protection layer (root apical meristem is covered by de rootcap). Instead, immediately below the tip of the shoot and laterally, leaf primordia developed from the meristem enlarge very fast to cover and protecting the apex of the stem where the meristem is located. Risopatron JPM, Sun Y, Jones BJ. 2010. The vascular cambium: molecular control of cellular structure. Protoplasma. 247:145-161.